Michael Samuelian AR'95 and assistant professor in The Irwin S. Chanin School of Architecture, has been elected as the President and CEO of the Governor's Island Trust, making him the director of that island's activities and operations. He began his first day on the job this Monday, and was interviewed by the Commercial Observer. J ust a five-minute ferry ride from Manhattan, Governors Island was a federal military post for nearly 200 years until 2003 when it was sold to the city and state of New York. 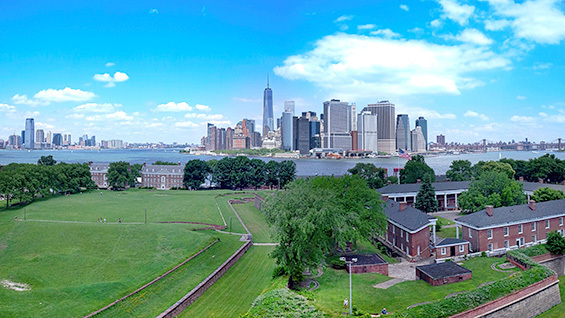 With the northern portion of the island run by the National Parks Service as a national monument, the Governors Island Trust manages 150 acres as a public park. Only open during the summer months, as of mid-September it recorded over 380,000 visitors this summer. Michael Samuelian takes over as the second president of the organization that runs the park. "As a born and bred New Yorker, I am both excited and honored to again serve this great city and its residents," Michael Samuelian said in the city's announcement. "Governors Island is a true gem that everyone in the city should be able to enjoy. Building upon all of the hard work that's been put into making Governors Island a great destination, I look forward to further enhancing the Island and introducing even more New Yorkers and unique experiences to this special place." To take the position Professor Samuelian resigned as vice president at Related Companies, where he focused on large-scale public-private development projects, most notably Hudson Yards. Prior to that he worked in public service in the City Planning offices of New York. He will continue to teach in the school of architecture, he says in his interview with the Commercial Observer. At The Cooper Union, Michael Samuelian most recently announced the creation of The Sue Ferguson Gussow Scholarship Fund, named after the professor emerita and 1956 graduate from the School of Art who still teaches drawing in the school of architecture after 40 years.